I love this sauce! It is good on just about everything. My favorite is on tacos, on Taco Night. New product for us - very good. I was an early adopter of this FABULOUS hot sauce. The hot version (not mild or extra hot) is our go to hot sauce. It is great with fish and chicken and has a unique savory quality. It's not overly salty like some hot sauces, and adds to almost anything you could want to spice up. I use it a lot in cooking to just give some warmth and flavor to any number of dishes. Easily one of my favorite hot sauces. Tis the best, great product, service, will try more soon! It is not very spicy for my tastes, but does have a little amount of bite that comes slowly. It is a sauce and would be great on tacos or something where you want a less thick sauce. Very neat taste- will buy again! This is perfect with Salmon. It is like it was made it. It is also very good with eggs. It ry to keep a couple bottles on hand. This stuff is great with chicken. If you want something quick, grill some slices of chicken in a little olive oil, brown, take off the heat and pour in the peri peri. Don't inhale..! Mmmmm Good Stuff! Something about the Peri Peri sauce is so tasty, I'm glad I was able to find it in a three pack! I'm sure it will be used up soon! I have been into hot sauces my entire life.The 3 Peri Peri sauces from South Africa are my all-time favorite.Great flavor and 3 seperate heat levels to choose from! I highly recommend everyone try them! Has decent flavor but majorly lacks heat. Had to use quite a bit to get the desired flavor. It is actually about as hot as tabasco sauce. I'd recommend the hotter version of this sauce. The mild is too bland. 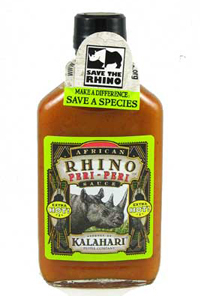 Dec 12, 2010 | By Dan G.
African Rhino Peri-Peri Hot Sauce is tasty. The "hot" version has as much flavor as it has burn. great with burritos. Good, civilized heat for a meal.